This afternoon Gina and I stopped by one of our favorite little shops, Eclectic Nature. Their address is 1503 Mt. Vernon Avenue, in the Del Ray area of Alexandria. They were having an “end of season” sale with all plants 50% off. There wasn’t much left, of course, so we left empty-handed (which doesn’t happen very often!). Eclectic Nature sells plants, unusual containers, and garden art outside. Inside the gift shop, you’ll find original paintings, jewelry, gardening supplies, home decor, knick-knacks, and other eclectic stuff. And you’ll most likely run into Max the cat. He’ll probably be right smack in the middle of the checkout desk, vying for your attention. 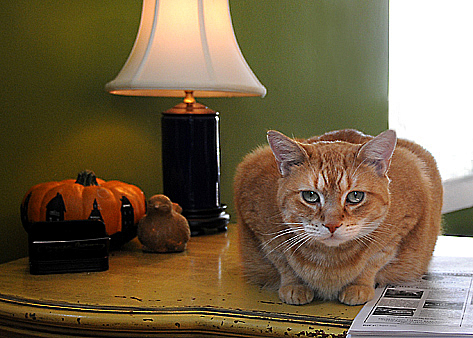 He had just come in from the nursery when I got this shot of him. He is the sweetest thing and very affectionate. He looks like a gargoyle, doesn’t he? © Cindy Dyer. All rights reserved. But honestly, is he as pretty as my boy, Jasper? …otherwise known as a “Japanese anemone.” The common name for this plant is “windflower,” and if you have ever tried to photograph this plant when there is a breeze, you’ll find windflower an appropriate name! Another common name is thimbleweed. I photographed these at Green Spring Gardens this morning. ‘Honorine Jobert’ is a vigorous, mounding, compact Japanese anemone hybrid best grown in zones 4-8. It was discovered in Verdun, France in 1858. This herbaceous perennial from the Ranunculaceae family reaches 3-4 feet high and spreads 1.5 to 2 feet. The beautiful 2″ snow white flowers bloom from August through September and the plant likes full sun to part shade. Low maintenance and easily grown in average, well-drained soil, ‘Honorine Jobert’ does best in part shade to protect it from wind. Once established, the suckering shoots will spread, so plant it where it has room to grow. Divide in early spring or autumn or take root cuttings in the spring. And row my blossoms o’er! didn’t wash the spider out! Pat’s web was gone early this morning. Then a little while later, despite the rain, she was spinning another one. The little white dots you see are water droplets. Today’s soggy, rainy day explains the somber gray background, of course. I shot the first photo right before I went out to lunch with a friend. The second photo was shot after I returned, and if you look closely, you’ll see Pat is wrapping up her freshly-caught lunch (a fly, I believe). Yum! The backlighting makes her orange stripes just glow in these photos. Now that looks like a spider, doesn’t it? After I shot the through-the-window images, I went outside to photograph Pat and she skidaddled. A bit past dusk she was back to web-central, legs extended, waiting for dinner. To give you a sense of scale, with her legs extended, she’s about an inch long (yes, I held a ruler up to the window…just for you). I must admit she looks a bit more spider-y-ish with her legs extended. She looks tick-ish in the previous posting, doesn’t she? This window was to the left of a computer in my studio. I was sitting here, designing away, and glanced up to see this little spider (okay, not that little—about 1/2 inch, I’m guessing) smack dab in the middle of its web. Behind the spider is the wood shed with its asphalt shingle roof. I grabbed my camera and got this image right from my chair to show you exactly what I saw and to test the exposure. Not a great background for my lovely subject, that’s plain to see, so I needed to “reframe” the shot to add a green background. I climbed onto the desk on my knees and reframed the spider against the pine tree to the right of the shed. By isolating it against a more interesting background, I got a nicer shot. I also shot this through the window, so I’m a little surprised it came out as well as it did! 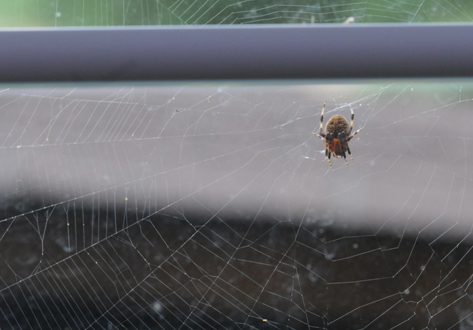 I believe this is a Barn spider (Araneus cavaticus)— just like Charlotte, from Charlotte’s Web. Check this link here for a comparison. In my quest to identify him (her? ), I stumbled upon Frank Starmer’s site. Starmer is the Associate Dean for Learning Technologies at Duke University. He introduces us to Sasha, a garden orb spider. It’s a fun and fascinating read with a lot of information about spiders and some great photos of spiders doing what spiders are inclined to do! He also lists references and I found this one interesting—Why a garden spider does not get stuck in its own web, written by Ben Prins. I pondered that very same question a few days ago. 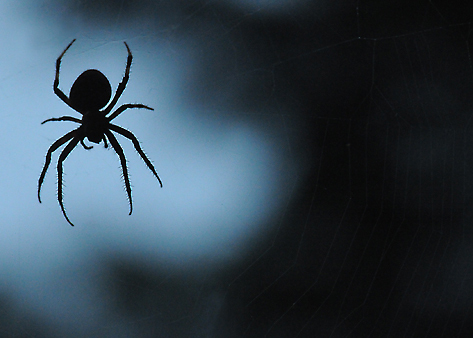 If you like spiders (and you should), spend some time on Frank’s site. He’s a font of information on spiders and clearly loves his subject. UPDATE: Thanks for the details on male vs. female in spiders, David. 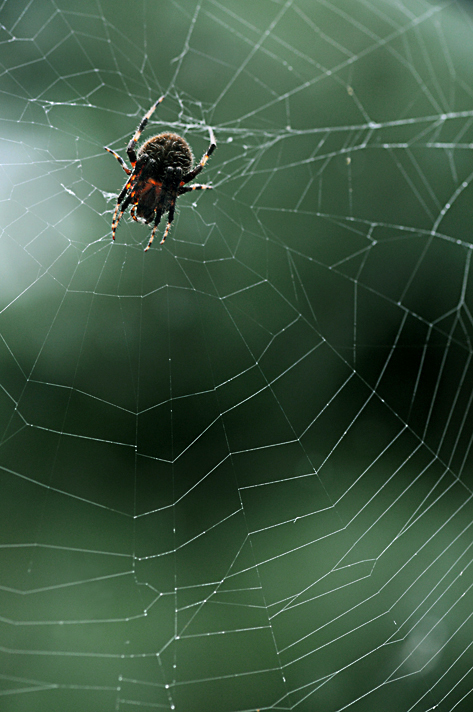 Read David’s comment on spider identification and habits. I figured it was an orb spider, but that other site had a spider on it that was very similar, which is why I thought it might be a barn spider. I just looked up “garden spider,” and it could be that as well. This Garden Orb Spider looks like mine and has the touch of reddish-orange on the legs, too. Then again, it might be the Neoscona crucifera. It could match several in the links you sent. Thanks for your help, David! 1) I finished a project for a client and they were on time and on deadline so I was able to upload to the printer by noon, which means I was able to…. 3) when I got back, the Walking Stick insect that was on my studio window right before I left was actually still there, five hours later, waiting for her closeup! I saw her as I was packing up my photo gear, made a mental note to remember to photograph her, then promptly forgot about it as I ran out the door. I thought it was a dried twig stuck to the window but then I noticed the uniform appendages sticking out of the sides. This is the first Walking Stick I have seen since I was a kid! I came down to my studio when I got home from the hospital, and when I saw she was still on the window, I ran out to photograph her. She disappeared about five minutes later. See there? She was waiting for me. —This species sprays a defensive odor that is offensive and irritating. I can’t vouch for that because this gal didn’t seem bothered by me. —They feed on the the leaves of many deciduous trees, including oak, hazelnut, sassafras, black cherry, and black locust. They also eat clover. 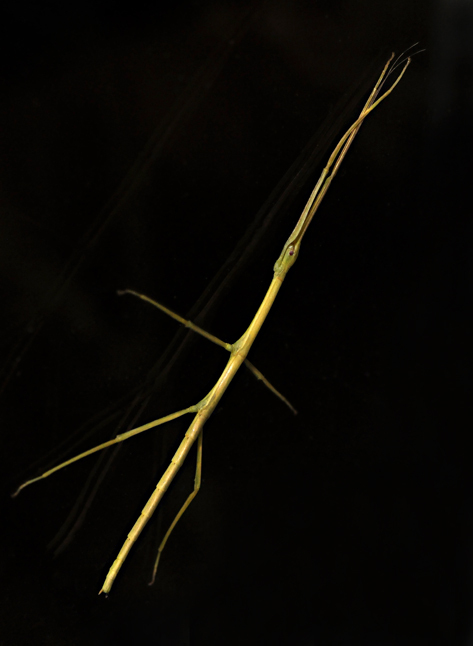 —Males grow to 3 inches long; females to 3-3/4 inches long. Their antenna can be an additional 2/3 of their body length. —They have the ability to regenerate lost legs (pretty cool). —They live just one year, laying a single egg dropped into leaf litter. Nymphs hatch in spring and become adults by late summer. —They are one of the few non-tropical species that can be collected (legally) in the wild to be kept as pets, and they’re hardy insects. I call this a “record shot,” although it didn’t turn out bad considering it was almost dark, I used a bounce flash, and the window ended up looking like a black velvet background. Of course I would have preferred this nestled on dark colored foliage in overcast light, but I’m just thrilled she was still there so I could immortalize her on film…er, pixels. See? It was a very fine day, indeed. A rush job finished on time…the honor of witnessing (and photographing) a baby coming into the world…and an unusual insect in my garden waiting for me to record her. Never a dull moment! I’ll be posting photos of baby Ashley and her family shortly. Finally! At long last, one of my newer Passion Flower plants has bloomed. I planted it on the side of the gazebo that gets the less sun exposure, which forced this plant to reach high up into the canopy to get the sunlight it needed. I spotted unopened blooms yesterday when I was watering the garden and knew they would be bursting soon. I noticed one fully opened this morning—three feet above my head, out of photographic reach. So, for you, dear friends and fellow bloggers, I dragged out the big ladder, set it half on the patio/half in the soil (for just the right angle), and perched precariously—risking life and limb—just to get this shot. I’m surprised I was even able to focus with the contraption I set up! 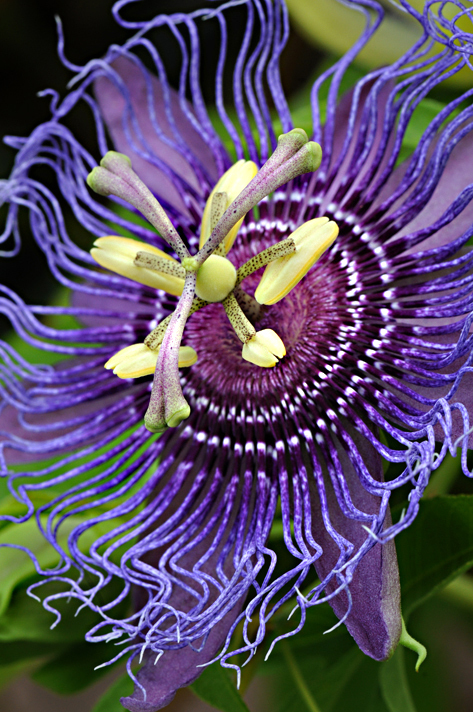 This is the same type of Passion Flower I photographed in my friend Gina’s garden—Passiflora Incense.